The Arthur and Area Historical Society serves both the local community and those who wish to research their roots in this area. 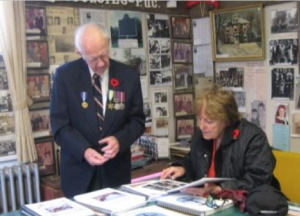 Arthur was described by the Toronto Star during World War II as “Canada’s Most Patriotic Village” for its contribution of volunteers and funding to the war effort. 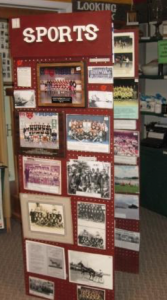 Thus, many of our exhibits are related to the military history of the area. The above photo shows a World War II Veteran’s Kit. However, there are many other exhibits: agriculture, sports (shown in the photo to the left), and many other activities. For further information on our Society’s work, contact us by e-mail for a complete list or check our Facebook page. We are run totally by our volunteers who have extensive local knowledge. 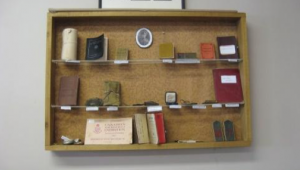 They assist in many ways, including services that are of use to those with genealogical interests, such as preservation and archiving of local historical documents and artifacts, and providing access to those items. Also, by providing assistance with research, particularly related to family roots (see photo below). Photo collections of local community groups, schools, etc.